More and more southern volunteers are lending a hand to people in Nunavut who are struggling to feed their families, but while many are thankful for the help, they say the charity is a band-aid solution to a deeper problem. More and more southern volunteers are lending a hand to people in Nunavut who are struggling to feed their families, but while many are thankful for the help, they say the charity is a band-aid solution to a deeper problem that needs fixing. Nunavut resident Tanya Enook Killiktee brushes away tears as she describes what it's like to be unable to provide more than one big meal a day to her family of nine. "It's the most stressful feeling you can ever go through, just to watch your children hungry and say 'Anaana [mother], I'm hungry' and I say, 'I know. I'm trying.'" Her five-bedroom house is packed with kids, ranging from ages 1 to 15, and she and her husband find it hard to keep up with everything. Killiktee works with the Government of Nunavut as a receptionist, but sews sealskin items on the side and looks for other ways to make money. "Everyday when I wake up, [I think] what shall I do to make money? What shall I do today so I can buy this and that ... food for my children." But when she's out making money to pay for the high cost of food, she worries about the clothes that are piling up on her broken washer and dryer and the dishes she has no time to wash.
To raise awareness of the high cost of food in the north and the struggles of families such as Killiktee's, Leesee Papatsie started the Facebook page Feeding My Family. The photos people post there of outrageous prices at grocery stores in the territory in turn inspired Vancouver Island resident Jennifer Gwilliam to start another Facebook page, Helping our Northern Neighbours. Leesee Papatsie is an activist in Iqaluit, well known for starting the Facebook page Feeding my Family. She says "Northerners shouldn't have to get so much donations from all over." (Tamara Pimentel/CBC)​"The more I looked, the more shocked I was that this was going on in Canada," says Gwilliam, "and I just thought that we needed to do something about it." The group started slowly, but once it got a bit of attention it ballooned to 12,000 members, connecting donors across the country with people in almost every Nunavut community. "[Earlier this week] someone donated $50,000 to one of the Nunavut communities to help there. And we had someone donate $10,000 to one of the school breakfast programs." Gwilliam says she's "astonished" at the success of the group, but recognizes that it's a "band-aid" for the food insecurity issue. Meanwhile, Papatsie says the generosity is filling a gap, but she wants to government to come up with a real solution. There is a program that's meant to deal with this issue: Nutrition North. The $60-million program subsidizes retailers' shipping costs for a list of foods chosen by the federal government. A recent auditor general report found the federal government has no way of knowing if the cost-saving from the subsidies is being passed on to consumers. Last week, the federal government issued a call for proposals to improve the controversial program. 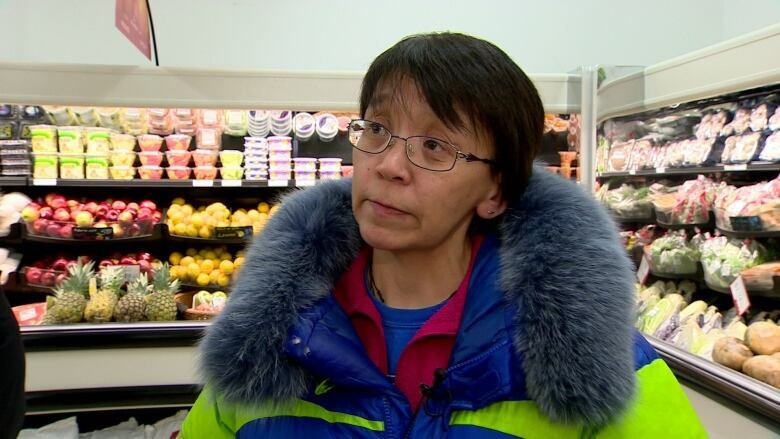 Papatsie is organizing a Nunavut-wide boycott of North West Company stores this Saturday to draw attention to problems with Nutrition North.